HER: Marshmallows are like men! I can eat the hot ones all day! Art by Vince Colletta Studio from First Kiss #34, 1963. 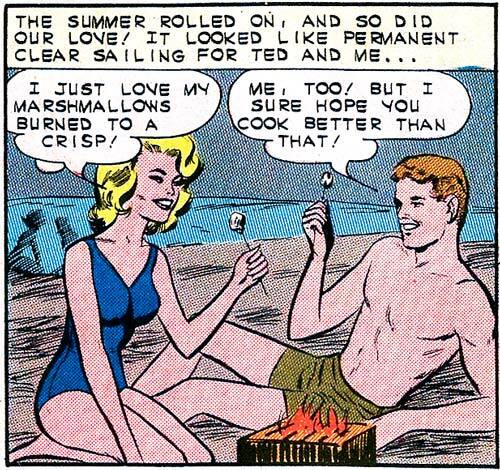 SCENE: Young woman and man at the beach are about to eat toasted marshmallows on sticks that they've roasted over a fire. WOMAN: See! I told you I can cook! 3 When you moved into your place your roomates and neighbors were obese. Now they’re all rail thin. 4 Your cooking kills any parasite or 3rd world disease the diner may have. 5 They took the microwave and rerigorator out of the breakroom becuz of you. 6 Yer coworkers, roomates, neighbors give you very hi value gift cards to cheap good eateries. 7 The supermarket refuses to sell you raw meat, and gives you a 90% discout at the deli. 8 The bookstore will not sell you any cookbook. 9. Your cooking will stop any vector disease. 10.Yer coffee can tar roofs and roads. 11. Wild predators run when they smell you. 12 At potlucks you bring the pop, otherwise you’re banned.